Doo Ho Choi Seriously Injured. Fight With Andre Fili Is Off. According to MMA journalist and analyst Robin Black, Doo Ho Choi has been seriously injured during training. That said, his upcoming bout with Andre Fili is now off. Choi was originally scheduled to face Fili in the undercard of UFC 214: Daniel Cormier vs. Jon Jones at the Honda Center in Anaheim, California on July 29, 2017. 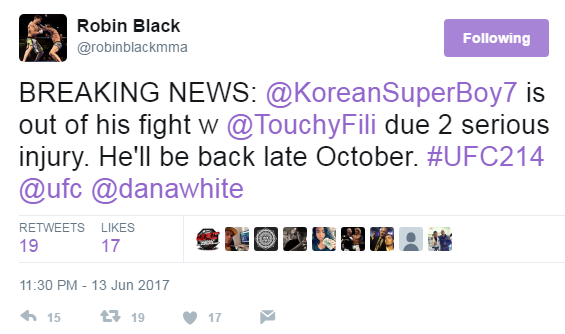 Black broke the story on Twitter, saying that the Korean fighter will be back around October. In a succeeding tweet, Black said that with rehabilitation, Choi can make it back to the cage as early as September. "Breaking news: The Korean Superboy is out of his fight with Touchy Fili due to serious injury. He will be back late October." The news came on the heels of another popular Korean fighter pulling out of the same event because of an injury. Chan Sung Jung, more popularly known as The Korean Zombie, was supposed to fight Ricardo Lamas. He pulled out of the fight due to an injury and was replaced by Jason Knight. The Korean Zombie made his return to the UFC last February, blasting Dennis Bermudez in the very first round. It's still unknown when he will be able to return. Fans of The Korean Superboy and the match-up with Fili went on Twitter to voice out their disappointment about the news. "No, darn it. Such a good match-up. I feel bad for Andre Touchy Fili and us fight fans", said @mmanytt. Choi last fought in December of last year against Cub Swanson. The two fighters went toe to toe in an encounter that a lot of fight fans consider as their "fight of the year".